Traffic pattern flying is part of every student pilot’s early training. And there’s much more to it than simply ‘flying a circuit’. 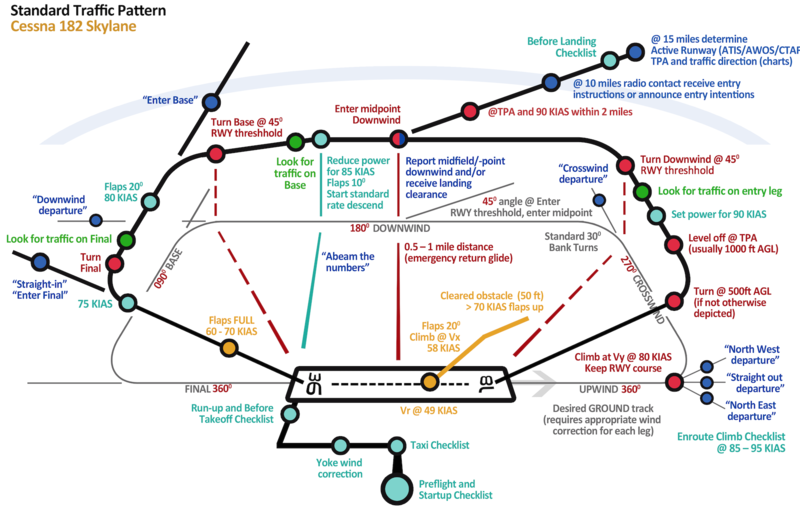 As part of my own PPL training, I put my learning into creating a handy diagram that graphically summarizes the standard traffic pattern procedure, including aircraft performance, flight manoeuvres, ATC, and short field takeoff and landing. And it’s yours too. If you come to spot any mistakes in the diagram, or have ideas for improvement, please let me know by commenting on this blog post below. I’m really interested in learning all there is to know about the Skylane and traffic pattern flying in general. I’m not an actual PPL certified pilot nor is this checklist approved by real-world pilots. I invite you all to critically review my traffic pattern and let me know if any items need changing, rephrasing, adding or removing. I’ll gladly upload improved versions if necessary. And if you like, consider subscribing to either my Facebook, Twitter or YouTube channel. While I’m still preparing my flight simulation training, I will soon start with posting flight review videos of my actual flights in Prepar3D and share the things I learned along the way. Thanks for commenting, Neil. Updated the diagram!